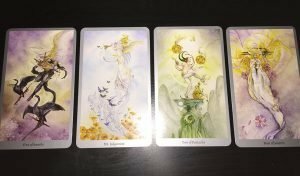 Hello and welcome to Walking the Royal Road, an ongoing series on using the Tarot (or Royal Road, in Aldin parlance) in Blue Rose AGE games. See also the first in the series, Part One: Friends & Loved Ones. Today’s article discusses the use of the Tarot in generating a backstory. Romantic fantasy heroes frequently have backstories filled with twists, turns, tragedies, and confrontations. By the time these characters reach adulthood, many of the heroes of Tamora Price, Mercedes Lackey, Diane Duane, and other such authors have experienced a great deal that has shaped them into the heroes they are today. Of course, in those novels we frequently get to see this happening, but most Blue Rose game begin with fully adult characters. This provides a way to mimic some of those challenges. The spread for this method is not static, but can depend on just how much backstory the player (or Narrator, if creating the backstory of a Narrator character) wants to have had. A good round number for beginning player character is probably three cards: one for adolescence, one for young adulthood, and then a card that represents the struggle that led to the hero’s first level in a player character class. If they’re starting off at higher levels, an additional card for each level or two is probably also appropriate. Feel free to also draw additional cards for major events. If your character is rhy-bonded, perhaps a card that reflects the events where that rhy-bond awakened in their lives. If they are part of the Sovereign’s Own, perhaps a card that represents them getting noticed or receiving training. If the character is older than a young adult, perhaps a card for every five or ten years since their young adulthood makes sense. As you can see, there are a great many options, with the possibility of many more. Try and keep your focus to five cards or less, as the more detail there is, the harder it gets to weave it all together into a single cohesive whole. This system is quite simple to use. Lay the cards out, face down, in a line. Then, from left to right, flip over each card, noting what stage or element of backstory this represents. Take the meaning of the card in question (using online resources or the booklets that frequently come with Tarot decks) as a prompt about the events the card represents; additionally, you can let the images on the cards themselves be a guide as well. Take notes; each of these cards is its own small story, but each is also a step in a greater story progression. In the image, we have laid out four cards to represent a new player character named Jaxan. Jaxan is a human adept (Forest Folk background) who is rhy-bound to a rhy-owl named Whisper. I have decided that the first card represents his childhood, the second card is his adolescence, the third card is the establishment of his bond with Whisper, and the fourth card is the achievement of his adulthood and the gaining of his first level of adept. Childhood: Five of Swords. This card shows a winged swordsman, with a pair of dark-hued geese or maybe swans at his side. The card itself represents discord and conflicts of interest, the feeling that the world is arrayed against you, so you feel justified in focusing only on your own concerns and profit. Jaxan’s childhood was clearly tumultuous, and it looks like he had to take care of himself, having no one else to do so. Adolescence: Judgment. This card shows a fey-like spirit among the flowers, playing music and surrounded by butterflies. The card represents release and renewal, having to make hard choices, making a judgment that may be harsh and difficult to face, but absolution comes thereby. With his adolescence, however, Jaxan was freed in some way by hard choices he made. Adulthood: Four of Swords. This card shows a maiden in repose, a blade clutched to her body, her head reclining on three other blades, while she is surrounded by flowers and a dove is perched at her feet. Its meaning suggests a moment of repose, meditation and centering, and finding one’s inner strength. Jaxan’s adulthood–and the full bloom of his adept powers–may have come about not as a result of some kind of sudden trauma or stress, but the alleviation of such. When he finally gets the chance to rest, to turn his attention inward, his arcane talents blossom. Here is just one example of this method for backstory generation. It’s far from the only one, to say nothing of the variety possible from other card results entirely! As he grew older, though, he couldn’t help but note the sorts of things his Da brought home more and more. Coin, certainly, but also other trading goods, clothing, even the occasional weapon. His Da would make a trip into Ennevan occasionally to sell it, though he was always very protective of his privacy, instilling in Jaxan the need to keep quiet about their affairs to others. But when a pair of envoys came to Avia, looking for members of a band of bandits operating nearby, the fourteen year old Jaxan realized just what it was his father did for a living. For the next couple of years, Jaxan held his father’s secret, though it ate at the sensitive and clever boy. He knew his own justifications became more and more absurd, but how could he betray his own father, even as neglectful as he was? He was the only family he had. But the next time someone came to Avis, seeking the bandits, it was a traveling noble and his companions, and they brought with them someone badly injured by the bandits. Face to face with the reality of the ill his father did, Jaxan fled to his home. Sleep eluded him, until he was forced to sit upright in bed. Tomorrow he would find the noble, and do what was right. As he decided that, something battered at the shutters to his room. He fearfully crossed to them, and opened them, to find a great silvery-white owl perched on the sill. You’ve made a hard choice, Jaxan, the rhy-owl’s psychic voice said, sounding old and wise in his head. But you’ll never be alone again, not so long as I live. The rhy-owl introduced himself as Whisper, and the next morning, the two of them found the noble and told him of his father’s crimes. Finding out that the boy had no other family, the noble offered Jaxan a place in her retinue if he wanted it. Like most of the young of Avia, he was knowledgeable in woodslore and knew this part of the Weald. He thanked her, but refused. His one brush with helping to enforce the law was painful enough; he wasn’t entirely sure he was cut out to do so as his vocation. Instead, he returned the key to his father’s house to the heads-woman of Avis, gathered a few of his belongings, and he and Whisper disappeared into the woods. Being perfectly at home in the woods, Jaxan spent some time getting to know Whisper, to mourn the loss of his father, but also to find some peace and clarity for the first time. It was in a forest glade that Whisper taught him to meditate and find his center, and over the next several months the two of them discovered and cultivated his arts in the animism and shaping (particularly plants) disciplines of arcane lore. Now Jaxan is a young man ready to return to civilization, and the beginning of this Blue Rose campaign!